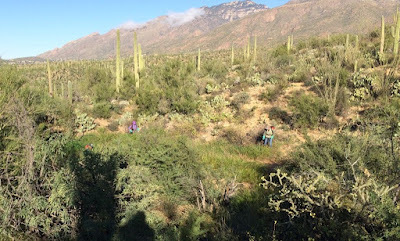 A special thanks goes to Sabino Stewards Janis Findlay, Tim Ralph, Cindy Rupp, Wayne Klement, Jeffrey Hahn, Barbara Lacey, Tim Wernette, Brian Desautels, Dan Granger, Tom Skinner, and Paul Kriegshauser. 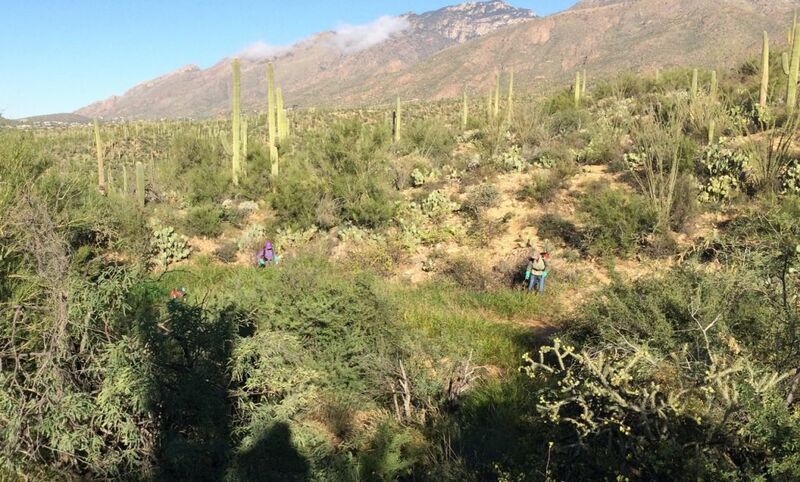 Each one of these volunteers shouldered heavy, sloshing backpacks at dawn in order to hike up Sabino Creek and the main road identifying and spot-treating invasive grasses that threaten to overrun Sabino’s native vegetation. 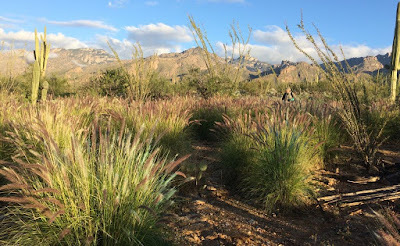 This fall Stewards spent 207.5 hours spray-treating perennial invasive grasses from Tram Stop 9 to the southern boundary of the recreation area and several infestations that are away from the road and creek, such as the new SARA trail. We have also treated African sumac (Rhus lancea) in the Sabino Dam area. It’s worth noting—because visitors sometimes ask—that we are using the herbicide Rodeo which has been tested by the EPA and approved for sensitive aquatic environments. Rodeo (or its generic equivalent) is preferred by land management agencies because it doesn’t persist in the soil long-term, doesn’t move from plant to plant, and doesn’t work its way into the water table. 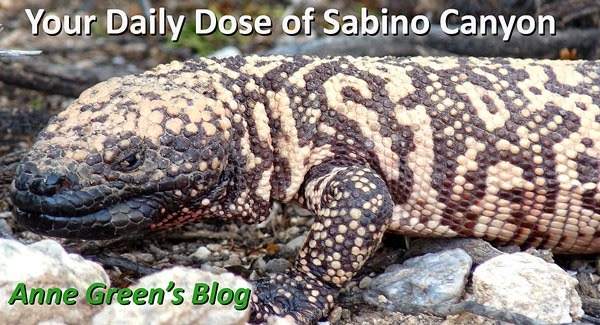 We use a solution diluted to 5 percent so the total amount of active ingredient is very low—ounces per acre. 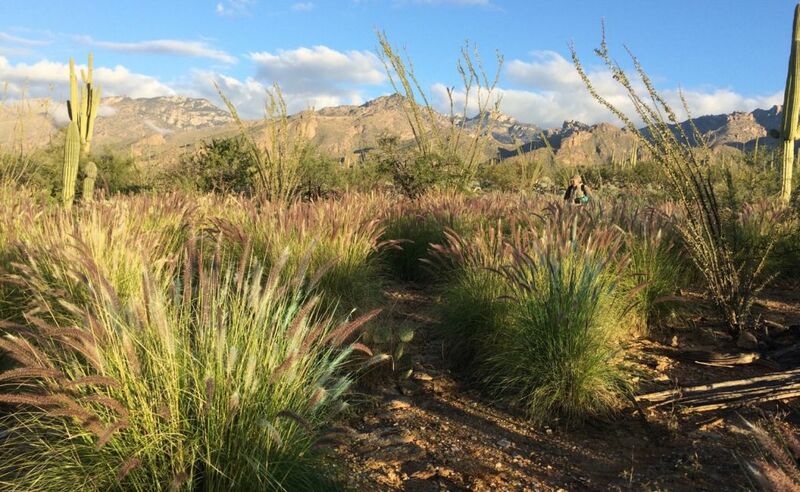 In the bigger picture, USFS Invasive Species Coordinator Chrissy Pearson is managing contractors who are treating Buffelgrass (Pennisetum ciliare) and Fountain Grass (Pennisetum setaceum) on steep slopes and remote areas of the rec area and the district. So an active strategy is in place and functioning. In response to concerns about the use of herbicide, I pose the question: What's the alternative? Some have suggested that we employ young people to climb to inaccessible places and dig out these grasses. In a world of infinite resources (and one in which we didn't put a high price on the well being of teenagers), I suppose we might find a way for this to work. Ensuring that every last bit of root and rhizome were completely bagged, brought down from the heights, and destroyed would make for a very long-term project. And in the meantime, the grasses would just keep on growing. The reality is, the only viable option we currently have at our disposal is to use herbicide to kill the entire plant. Big thanks to Mark and Jean Hengesbaugh for getting people and things moving against the invasives.